OTTAWA, Nov. 23, 2016 /CNW/ - The Ontario tourism industry's best and brightest were celebrated at the annual Ontario Tourism Awards of Excellence Gala on Tuesday, Nov. 22 at The Westin Ottawa. The Ontario Tourism Awards of Excellence recognize industry successes by acknowledging those who have made significant contributions to Ontario's tourism industry. Jointly presented by the Culinary Tourism Alliance (CTA), the Ontario Tourism Marketing Partnership Corporation (OTMPC) and the Tourism Industry Association of Ontario (TIAO), the Ontario Tourism Awards of Excellence are divided into three respective categories. The Culinary Tourism Awards of Excellence are about the passion and excellence of those dedicated to advancing food tourism in Ontario, and recognizing those who work hard to tell the stories of our growers, producers, chefs, winemakers and brewers. The Tourism Marketing and Travel Media Awards of Excellence celebrate those who contribute to Ontario's tourism industry through impactful partnerships, marketing activities and media relations. The Tourism Industry Awards of Excellence are presented to organizations, businesses and individuals that represent the quality of outstanding offerings that make Ontario a world-class destination. In addition to the Ontario Tourism Awards of Excellence, this year Attractions Ontario also presented its Ontario's Choice Award for Top Attraction. New for 2016, Ontario's Choice Awards called upon Ontario tourists and locals alike to let their voices be heard. From February until September of this year, fans placed their votes for their favourite attractions in eight different categories. For more information on each award category and the winners' achievements please see the attached backgrounder. Congratulations to all of the 2016 winners! Each one exemplifies Ontario's diverse, vibrant tourism industry, and demonstrates clear a commitment to making Ontario one of the best destinations in the world. 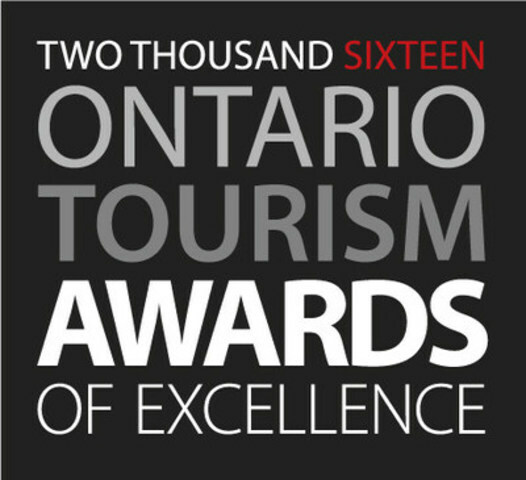 "The Ontario Tourism Awards of Excellence celebrate our industry's top achievements. We're proud to recognize these achievements—and the individuals who bring them to fruition—each year as part of the Ontario Tourism Summit." "This year's winners are shining examples of what food tourism development can do to build economic growth and community in Ontario's diverse regions. Congratulations to all involved—we look forward to another delicious year of discovery in Ontario." "Congratulations to the winners of the 2016 Ontario Tourism Awards. Your work to advance culinary tourism, develop exciting experiences, and innovative marketing plans help to attract visitors from all over the world to Ontario. Your successes contribute to a dynamic tourism industry that stimulates our economy and has a positive impact on communities across the province." "On behalf of the OTMPC, it is with great pleasure that we offer sincere congratulations to the 2016 finalists and award winners! It is a privilege to work with tourism industry partners that demonstrate the level of commitment, vision and passion that propels Ontario to greater economic success and whose efforts help us position Ontario as a preferred global destination." Through strategic product development and stakeholder consultations, Tourism Oxford helped reimagine the area's celebrated Cheese Trail, bringing in record amounts of visitors and creating a sense of community amongst those who live in the area. A new website coupled with their steadfast leadership has reinvigorated the area and brought new interest to the Dairy Capital of Canada. As you journey through Ontario's southernmost wine region, you quickly discover there's something special about Windsor-Essex Pelee Island wineries. The EPIC passport is a way to easily unlock their secrets and includes discounts, a full map, event listings and information of where to eat, stay and play in the region. It's a self-guided experience made better by the welcoming nature of the experiences along the way. Since 2006, Beau's All Natural Brewing Company, located in Vankleek Hill, has been brewing award-winning beer using certified organic ingredients & local spring water. Beau's Oktoberfest is the company's annual signature fundraiser. The festival brings 20,000 people to the small Eastern-Ontario town every year to enjoy delicious craft beer from over 50 other craft breweries, as well as local cuisine created to reimagine the Bavarian theme from over twenty different restaurants from the area. The Headwaters 2015 Four-Season Visitors' Guide was the first embodiment of the region's new consumer identity. With a brand promise of "Where Ontario Gets Real", all content, photography, and in fact the entire team itself had to be authentically Headwaters. The editorial content was fresh, original and showcased everything that is our "real". Photography was critical. Our people were showcased in stark black & white. Edgy and funky -- appealing to our target market. But also a bit of a throwback, a nod to our history and heritage –everything that makes Headwaters "real". It's not a traditional tourism guide; in fact, we call our Guide a consumer lifestyle magazine – and consumers loved it! Grey County Tourism provides destination management and marketing to increase sustainable tourism revenues through all four-seasons. The 2015 Summer/Fall Digital Campaign focused on promoting key trip-motivating experiences to Grey County; waterfalls, paddling, cycling and fall harvest & touring, including the Apple Pie Trail, Owen Sound Salmon Tour, and Saints & Sinners. The fall campaign also included the "Ultimate Fall Colour Adventure Contest". The digital campaign generated a total of 3.2 million impressions, 118% increase in web sessions, 250% increase Facebook engagement and resulted in 5,000 mailed packages and 6,500 downloads. In August 2015, CTV's The Amazing Race Canada, Canada's most-watched summer television program, showcased to viewers an unexpected and eye-catching side of Greater Sudbury. Assembled by the Sudbury Tourism team, six organizations partnered to attract and host The Amazing Race Canada, a unique platform in a medium that is typically out of reach due to cost. In addition to the City of Greater Sudbury, OTMPC and Tourism Northern Ontario, along with Vale, Laurentian University, Science North and Health Sciences North were all integral to this innovative partnership. Josephine is a full-time freelance writer who explores and writes about destinations around the world. One of her favourites is right here in her backyard—the Thousand Islands of southeastern Ontario. Colin Field is a writer, photographer and editor that specializes in outdoor adventure. Formerly an editor at Mountain Life, SKIER and SBC Kiteboard he's now a full-time freelancer for various clients, both in a commercial and editorial capacity. When Headwaters rebranded, it was positioned as the home of rural enjoyment and simple, authentic living (R-E-A-L). "Real" became our brand promise. Over the summer of 2015 the brand was activated through events, trade shows, and lots of other top-secret, guerilla-esque shenanigans. A Headwaters "horse" made an appearance in downtown Toronto; consumers were invited to "show us their real" and were placed on their own magazine cover. And because our brand is about our people and their connection to place, we decided to let them speak for themselves! So we introduced our people through digital storytelling that simply, eloquently, humorously and inspirationally told the story of Headwaters: Where Ontario Gets Real. The mission to expand our digital footprint and build awareness of the Chi-Cheemaun Ferry, while connecting with our target audience on an emotional level, was accomplished through the diversity of this campaign. Creative digital assets included web banners, pre-roll animated videos, promoted social posts, social media profiles & presence along with the re-design of www.ontarioferries.com, allowed for deep, engaging story telling. Overall, web traffic for the entire site season grew 17% increasing the total sites visits to 436,062 with 41,177 direct web visitors from paid media, which thus played a key role in the substantial growth in ridership. The Chelsea is committed to ensuring that persons with disabilities have access to the same information as all guests, consistent with the principles of dignity, independence, integration and equal opportunity. The Chelsea's innovation is best exemplified through its adoption of the Closing the GAP (Guest Accessibility Package) program; designed to enhance the hospitality experience for persons with disabilities, it provides guests of the Chelsea Hotel with amenities and surroundings in a way that speaks to persons with disabilities. The package helps minimize any potential accessibility barriers due to lack of communication and information. Designed by Accessibility Professionals of Ontario (APO), a full service accessibility consulting firm, the Chelsea Hotel was the first hotel in Ontario to implement the program. Chicopee Tube Park designed and built a Holding Pond to capture melting snow, rain and storm water-run-off, in an effort to reduce costs for electricity and remove reliance on municipal water to make artificial snow. The park requires about 4,023,340 gallons per winter seasons to make artificial snow, an approximate cost of almost $39,000. Following construction of the Holding Pond, the park used stormwater to handle all of its snowmaking for 2015/16. All water used for snowmaking was recovered from the park site, energy savings resulted in approximately $6,000 in electricity costs, and the park removed more than $38,000 in annual municipal water costs, replacing this expense with renewable infrastructure that captures on-site storm water. Tourism Employer of the Year—Haunted Walks Inc. Since 1995, tour guides from Haunted Walks Inc. have been entertaining and educating the public with Kingston, Ottawa and Toronto's darker history and many ghost stories. Over 80 tour guides are easily recognizable by their dark cloaks and lanterns, and they've hosted over 80,000 visitors on tours between the three locations in 2015. The management team includes several members who have worked for the company for 10 years or more, and some tour guides have worked with Haunted Walks for up to 15 years in the company's 21-year history. Haunted Walks offers its employees flexible, online scheduling, involvement in decision-making through employee-led committees, as well as a profit sharing program, among other perks and initiatives. Barrie owns and operates Yours Outdoors, a company that specializes in experiential tourism and offers unique adventures in nature, art and culture in the Haliburton Highlands. In addition, Barrie is co-chair of the Haliburton Highlands Tourism Stakeholders Group, Past Chair of Adventure Haliburton, as well as an active member of Ontario's Highlands Tourism Organization Travel Trade Partnership, vice-president of the Haliburton County Community Cooperative, and project manager for the Hike Haliburton Festival. Barrie also provides consulting services in tourism, outdoor and ecological education, trail development and management, and community development. The Headwaters Parade of Horses was an innovative undertaking utilizing 26 life-size fiberglass horses as the canvas for a public art project in anticipation of the arrival of tens of thousands of visitors for the equestrian events of the TO2015 Pan Am Games. The life-size canvases became innovative "wayfinding signage" that encouraged extended length of stay and encouraged exploration of the ancillary tourism offerings available across the 2,534 sq/km rural region of Ontario. The Headwaters Parade of Horses was a "big idea with a $0 budget" that galvanized the industry and the broader community and became the hallmark of the TO2015 Pan Am Games for the Headwaters region, and a legacy for the Games that lives well beyond the competition itself. Every year in June—due to the passion, love and commitment of hundreds of volunteers, a small staff and a roster of generous sponsors and partners—music takes over Burlington's downtown and waterfront. Sound of Music Festival showcases an eclectic combination of new and emerging artists, blasts from the past and some of today's most popular performers, all in an outstanding lakeside location, largely free with ticketed options. The Festival is an integral part of our Canadian culture, recognized as a tourism driver and, is the largest music event in the Hamilton/Halton Regions. Canada's Largest Free Music Festival is regarded as culturally significant through its music entertainment variety and appeal to all demographics, tastes and ages. Data collected from an economic impact model demonstrated significant economic activity as a result of this event, including $4.4 million in spending by non-local attendees, and a total of $11.7 million generated in overall economic activity. Grace has been a leader in Ontario's tourism industry for over 20 years. Currently the Executive Director of Resorts Ontario, Grace has sat on a number of committees for the OTMPC, including the organization's International and European Committees. Most recently, she served as Vice-Chair on the OTMPC Board of Directors. Grace has also sat on the boards of the former Tourism Federation of Ontario, the Ontario Canada Select Board, and the Ontario Canada Select National Board.